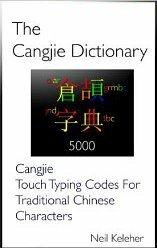 The Cangjie input method is a system by which Chinese characters are entered into a computer via a keyboard. It was invented by CHU Bong-Foo 朱邦復 in 1976. Cangjie-5 (version 2008) can be used for both traditional and simplified Chinese characters, including Hong Kong supplementary character set. The corresponding input method editor for Windows XP system, available from chinesecj.com in Malaysia, supports 70000 Chinese characters. To this end, character glyphs (unified CJK ideographs + extension A + extension B + extension C) in UniFonts5.3 (25 Mb) must be installed. These character glyphs (UniFonts5.4) are also available from Hai Feng Wubi Chinese input freeware. Windows Vista system already supports these character glyphs. 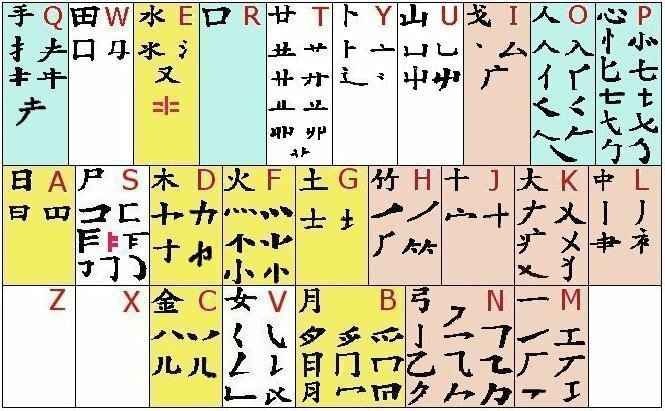 However Cangjie-5 does not allow inputting CJK extension C character glyphs [U+2A700 through U+2BA7F] and extension B character glyphs are visible only in MS Word file. Extension C character glyphs are visible from Unihan database and 国学字箪 > 汉字编码表 both using FireFox3 browser only. Acrobat Reader will not display Chinese properly if you do not have the proper Chinese fonts from Adobe installed on your system. Chinese popup translator Chinese Perapera-kun. Simply put this extension in FireFox will allow you read Chinese on websites. GB18030-2000 - The new Chinese national standard, including mapping table in txt format from SUN. Generating a GB 18030 mapping table. Mapping table for UNICODE to GB18030-2005 conversion (unified CJK ideographs + extension A + extension B), an MS Excel file (7.0 Mb) provided by http://blog.csdn.net/fmddlmyy/. PRC national standard GB 18030—2000 (PDF file). Dirk Meyer provided an English summary, explanations, and remarks of the GB 18030-2000 standard (PDF file). Dirk Meyer presented the two new Chinese character standards: HKSCS and GB18030-2000 (PDF file). HKSCS-2004 is the Hong Kong Supplementary Character Set which includes 4941 characters; HKSCS-2004 mapping table in Big5 and in ISO/IEC 10646:2003. UNICODE from fileformat.info: UNICODE characters supported by the DFSongStd font. WAZU JAPAN provides gallery of UNICODE fonts. UNICODE fonts for Windows computers from Alan Wood’s UNICODE Resources. ISO 10646 provides a unified standard for the coding of characters in all major languages in the world including traditional and simplified Chinese characters. The ISO 10646 standard and UNICODE are code-to-code identical. UNICODE can be regarded as the implementation version of the ISO 10646 standard. ISO 10646 漢字全集: SuperCJK searcher 目前共收錄亞洲地區使用之中文字70,205個字 (包括CJK、CJK Ext-A、CJK Ext-B). UTF-8 stands for Unicode Transformation Format-8, which is an octet lossless encoding of UNICODE characters. Foire aux questions des Tuteurs : UNICODE, UTF-8. The 24 main signs of Cangjie input method and their associated secondary signs. Copyright 2002- pascal-man.com. All rights reserved.